Coach Scoggin has been the Head Diving Coach of the Longhorns Diving Camp since 1995. 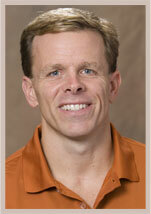 He is in his 23rd season as The University of Texas Head Diving Coach. Coach Scoggin is a former NCAA Champion for The University of Texas, U.S. Olympic diver, and a 2000, 2008 & 2012 USA Olympic Diving Coach. He is a eight-time NCAA Coach of The Year, and two-time U.S. Olympic Committee’s National Diving Coach of the Year. camp experience to all that attend. Jon will be the main source of communication for parents, campers, and staff. This will be Coach Beau's fourth season with The Longhorns Diving Camp. Coach Beau graduated from the University of North Carolina Wilmington where he also dived for the Swimming & Diving team. He has coached in numerous summer leagues, high schools, and was the Assistant Diving Coach at Duke University before returning as the Head Diving Coach with his alma mater, the University of North Carolina Wilmington. Coach Stephanie will be joining us for her fifth season at The Longhorns Diving Camp. She attended the University of Michigan and dived for their Women’s Swimming & Diving team. She spent most of last season as a volunteer coach at St. Bonaventure University, and prior to that was the Head Men’s and Women's Diving Coach at The University of Findlay, St. Bonaventure University, and the University of Buffalo. Stephanie has also coached diving camps at the University of Michigan and the University of Buffalo. ​A native of Norway, Kris Jorgenson is in his third season as the head diving coach at The University of South Dakota and his first summer with The Longhorns Diving Camp. Jorgenson has been named the Summit League Diving Coach of the Year, and led his squad to multiple Summit League titles and NCAA Zone D appearances. The former 12-time Norwegian national champion was also a standout diver at The University of Minnesota, and was the 2012 Big 10 Co-Diver of the Meet. He received his Batchelor's degree in psychology from Minnesota, and completed a Master's in Applied Sport & Excercise Science. As a native Texan, Coach Mark has been a part of The Longhorns Diving Camp for several years, as a camper, counselor and now in his seventh season as a coach. Coach Mark dived in many US National Championships, and graduated from the University of Wyoming where he also dived on the Swimming & Diving team. Coach Mark was the head diving coach at the University of Northern Colorado, and is currently the Head Diving Coach at North Texas University. This will be Coach Jacquie's second season at The Longhorns Diving Camp. Jacquie has been coaching diving for 10 years, and dove collegiately at The University of Akron. She has coached diving teams at Akron and Greensboro. Jacquie is currently the Head Age-Group Diving Coach for RedWolfe Elite Diving in Raleigh, NC. Logan Pearsall joins the camp for his first season with The Longhorns Diving Camp. He enters his fifth season at Colorado Mesa University. Pearsall coached CMU's first Division II individual National Champion in 2018, and was named the CSCAA NCAA Division II Men's Diving Coach of the Year. He received his Bachelor's degree in Athletic Coaching from Clarion University, and his Master's in Athletic Administration from Concordia University-Irvine. While competing at Clarion, he won four D-II Diving championships between the 1 and 3 meter springboards. Manny Pollard joins The Longhorns Diving Camp staff for the 2019 season. Pollard is in his second season at the University of Illinois. Prior to Illinois, Manny worked as a coach for the Minnesota Diving Academy from 2012-16. He was a two-time Minnesota Diver of the Year, and a three-time All-American at The University of Minnesota, scoring all four years at the Big 10 Championships on 1-meter, 3-meter, and platform. This will be Coach Bill's fifth season at The Longhorns Diving Camp, and he has been coaching for 16 years. Bill recently joined Red Wolfe Elite Diving Club after head coaching stints at Old Dominion University and St. Boneventure University. He has also coached at Northern Michigan, and has extensive camp experience coaching at Clarion University, Ripfest, and Indiana University. This will be Michael’s second season with The Longhorns Diving Camp. Michael is from Scranton, Pennsylvania, and just completed his sophomore year at St. Bonaventure University where he is a member of the Men’s Swimming and Diving Team. Michael is also a Longhorns Diving Camp alum, and is looking forward to helping everyone have a great camp experience! This will be Parker's second season with The Longhorns Diving Camp. Parker hails from Plano, TX, and is finishing his sophomore year at Texas focusing on Sustainability Studies. He's worked with children as a swim instructor, and volunteers his time with children with disabilities.